The Complete Guide to Autism Treatments was inspired by parents of children afflicted with autism. After speaking with several thousands of parents about various treatments and answering similar questions over and over again, Dr. Freeman realized that parents need a clear way -- a guide -- to help make appropriate treatment decisions for their child. To this end, Dr. Freeman gives her scientific evaluation of most of the major and minor autism treatments available today, and then personalizes the analysis by telling the reader whether or not she would use the treatment on her own child. In other words, at the end of the day, how did she apply her understanding of the science to her own child? With this book, it is Dr. Freeman’s sincere hope that everyone will be able to evaluate all the current and future autism treatments available. It is crucial to be able to ask the right questions and find the flaws in the science behind every purported treatment, or to find the evidence, where it exists, that the treatment is effective. At a minimum, understanding the scientific method will protect thousands of children from quackery and, hopefully, provide parents and professionals with the tools to discern those treatments that are effective for children afflicted with autism. Section One of The Complete Guide to Autism Treatments, scrutinizes the range of treatment options offered to parents of children with autism and uses the tools of the scientific method to evaluate each treatment method so that parents can make sure that the treatment they have chosen for their child stands up to the claims made by the treatment provider. Section Two of the book is designed to provide a background in science for parents or professionals who are newcomers to the scientific method. 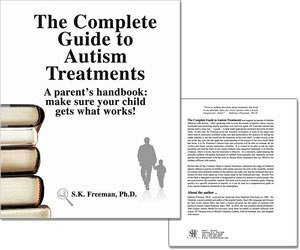 The book can be used as a reference guide, flipping quickly to a specific treatment of interest, or it can be read as a comprehensive guide to every autism treatment advertised in the marketplace.